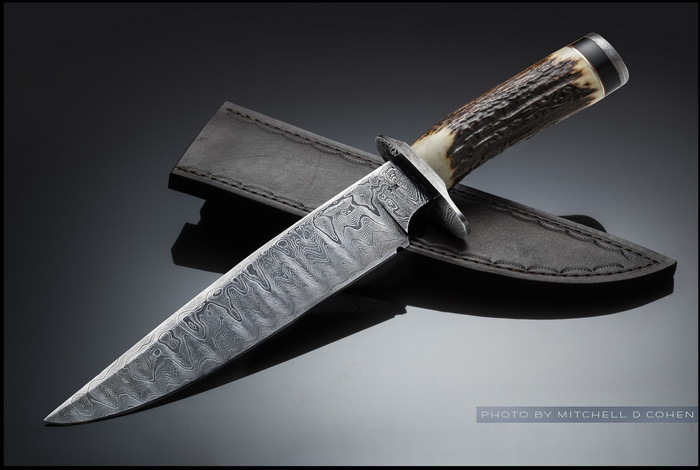 **** Chosen by Winner: Daryl R.
Craig Steketee has forged a striking Damascus Bowie with a 9.5-inch blade of his Ladder Damascus (made from 1084 and 15n20 High Carbon Steels), 15 inches overall length. The handle is Stag with Buffalo Horn and a Damascus guard and pommel. A pouch style leather sheath is included. Craig began designing and crafting custom knives full-time as “STEK KNIVES” in 1991. His son, Adam, has been working with him part-time since then, and full-time for the last few years hand forging all of their steel and creating some of the best Damascus in the country. Craig is a member of “Professional Knifemakers Association” (PKA) and “The American Bladesmith Society” (ABS). He received a Bachelor of Fine Arts from Ft. Wayne Art Institute in 1974 and a Master of Fine Arts from Western Michigan University in 1976 majoring in sculpture and printmaking. He taught art at the university level from 1977 through 1991. His sculptures, paintings, and prints have been exhibited at numerous art galleries and museums throughout the country. Craig first began forging and casting steel while in graduate school. Adam, 6 years old at that time, was his helper even then. His knives have been illustrated in the Knives Publication (by Ken Warner), the Knife Magazine, Blade Magazine, Fighting and Tactical Knives. His shop is located in Billings, Missouri which is located just 20 miles southwest of Springfield and one hour northwest of Branson.